In 2016, a total of 1.02 million acres of potatoes were harvested in the United States According to www.Agmrc.org. 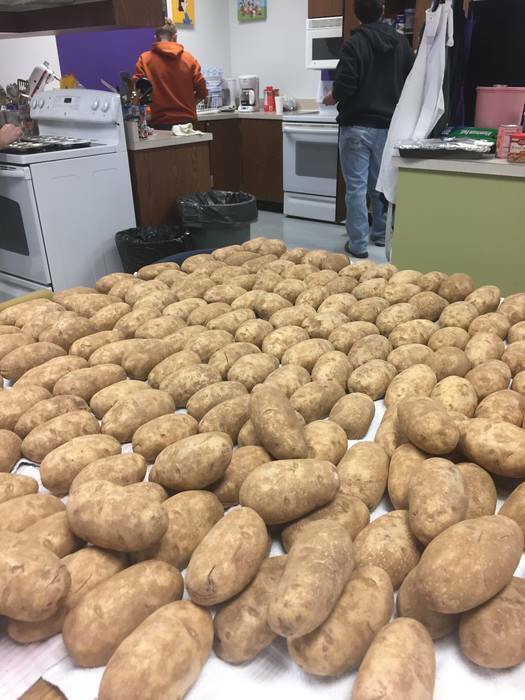 Potatoes are known to be a source of comfort food, which is why FCCLA ( Family, Career and Community Leaders of America) had one on Friday February 3rd. Each member in the club brought in anything from potatoes, to chili, to even cake. All the proceeds are going towards FCCLA funds. Potato bars are great for fundraisers because everyone loves potatoes and all the yummy toppings they get to put on them.” said Rosa Blaske Jr.
Running a potato bar takes lots of hard work. Students in Mrs. Joseph classes helped wash potatoes, made cakes and even helped wrap the potatoes in foil and put them in the oven to bake. Then later at the game, FCCLA members helped out with the potato bar to make things go smoothly. “ FCCLA made over 650 dollars in profit, this money will go towards future FCCLA events and even state events” said Mrs. Joseph FCCLA sponsor. This Friday at the Basketball game Vs Axtell, Deandra Woodyard will be holding a potato bar to help raise money for her Star Event.